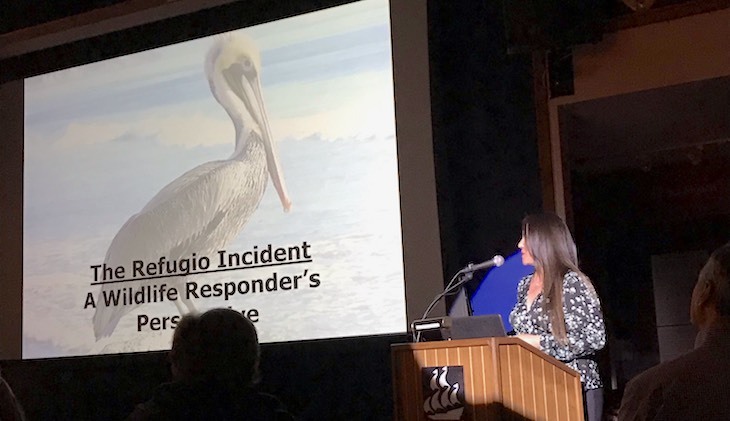 Earlier this month, on March 14th, the Santa Barbara Maritime Museum hosted a lecture by Elaine Ibarra, director of the Santa Barbara Wildlife Care Network. Right on the waterfront, general attendees, board members, sponsor Marie L. Morrisroe, and more were greeted by the brightly lit exhibits, a plentiful array of snacks, and the museum’s executive director Greg Gorga. Once Ibarra began to speak and the screen changed to show a picture of the first long-beaked seabird, however, everyone became fully absorbed in the discussion of our local coastline. Ibarra began with the Alaskan Valdez spill of 1989, and Terrie Williams, her personal hero. The Valdez oil spill, as the first spill to really get plenty of press due to a leaked photo, started Williams’ public work responding to oil spills. She faced down three federal arrest warrants, lost her job and lost her house, but never gave up on her work. Today she is a professor at UCSC, working with students in the Williams ICE lab. The Valdez oil spill led to public intervention, including a young girl’s letter to her senator, and eventually to the founding of the Office of Spill Prevention and Response, a California organization. In 1994 the Oil Wildlife Care Network was created, of which the local Santa Barbara Zoo, the Channel Islands Marine Wildlife Institute and the Santa Barbara Wildlife Care Network are members. The reality of the issue for the Santa Barbara Wildlife Care Network is not whether another oil spill will happen, but rather when and where it will. Even ignoring the famous ones, like the 2015 oil spill at Refugio State Beach, a tipped-over truck or other inland accident can cause spills like The Grove Incident in 2016 in Ventura. The Grove Incident, though not as publicized, essentially created a black oil river behind people’s houses. Additionally, the Santa Barbara Wildlife Care Network treats about 3,300 animals a year. The result is an immense emphasis on preparation, abundant paperwork, and multiple levels of response. While volunteers are more than welcome to join through the proper channels, the work by unsupervised volunteers can be dangerous to both the humans and animals, not to mention creating a lack of proper oil disposal. On a larger scale, the oil-response organizations focus on readiness, response, research, and “reaching out,” or teaching/publicity. Feel free to keep a look-out for banded pelicans and contact the SB Wildlife Care Network with your observations. The research teams will appreciate it! Also, simply within the SB Wildlife Care Network, four separate groups of reconnaissance, “hazing” or scaring endangered wildlife away, recovery, and field stabilization exist. Each bird or animal must be handled differently, washed, and if appropriate, water-proofed. 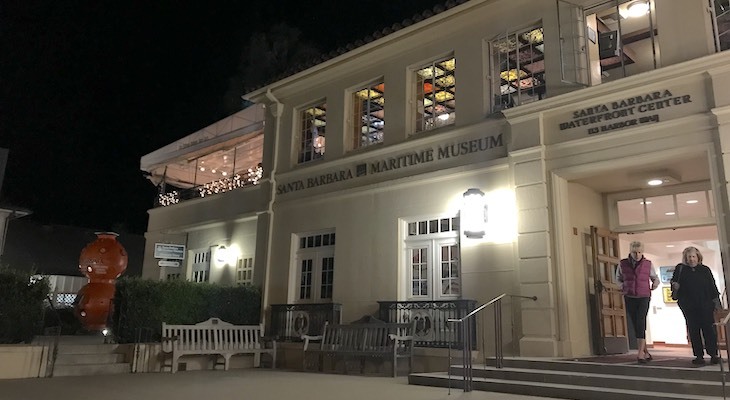 Ibarra jumped at the invitation to speak at the SB Maritime Museum and has a great enthusiasm for outreach, symposiums, and education in general. Even before her first proper spill at Refugio State Beach, she’d clocked in well over 100 hours of training. Today she gets to work early, prints treatment lists and other paperwork, and gets right into the thick of animal care, not leaving until she’s prepared everything to run through the night. When a spill happens, fourteen-hour days commence while everyone responds to help the animals and birds recover and heal. As a 501(c) non-profit organization, the Santa Barbara Wildlife Care Network welcomes volunteers and donations at https://www.sbwcn.org. People committed to public causes have a huge positive impact. They also inspire others to do more with life than go to work, come home, eat, watch fantasy TV, sleep. live for some weekend sport. The SB Wildlife Care Network is a top-notch invaluable organization. When I found a sickly Western grebe on a local beach, within 20 minutes SBWCN had a volunteer there to collect the bird from me. I was so happy with the response time and relieved to know the wildlife experts would work to save the bird. Anyone and everyone who might find themselves in a similar situation to mine should have the SBWCN phone # on speed dial : 1-805-681-1080. You, too, might one day help a shorebird or other wild animal who needs expert care.